Chocolate & nut lovers alike will crave this deluxe assortment of chocolates, chocolate snacks, and chocolate nuts. This gift is perfect for a family party, office party or just to simply treat someone special. 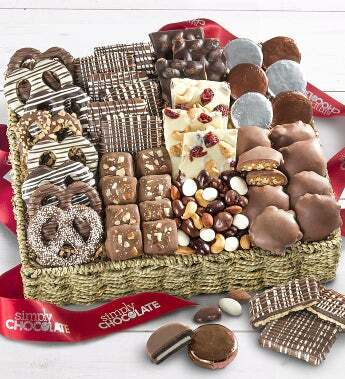 The natural woven seagrass tray basket is brimming with chocolate grahams, pretzels, nut barks, OREOs, almond toffee, Tuxedo Decadence nut mix, and more. Beautifully presented with a Simply Chocolate logo ribbon. Gift measures 14" x 10.5" x 4"
Ttl Net Wt 3 lbs.